This has been a busy stretch for Kingo, the Guatemala-based company with ambitious plans for installing small scale, hyper-distributed solar plus storage systems in off grid communities. Last August, Kingo closed on a round of $8 million funding to expand operations, and last month it announced that actor and environmental leader Leonardo DiCaprio has joined the company as an investor, and will also act in an official capacity as an advisor. So, how did the company’s business model attract the interest of this super high profile activist investor? Kingo CEO and co-founder Juan Fermin Rodriguez spent some time on the phone with CleanTechnica to provide our readers with the answer, so read on. Kingo is new to the CleanTechnica radar, so let’s take a quick look at the company before we get to the interview. The Kingo product is a fully installed, all-in-one solar plus storage system. Generally speaking, it’s similar to the small scale, pay-as-you-go solar systems that are emerging as a way to provide off grid communities with electricity, minus the expense and impacts of central power plants, transmission lines, substations and user hookups. Kingo launched as a 500-household pilot project in 2014. 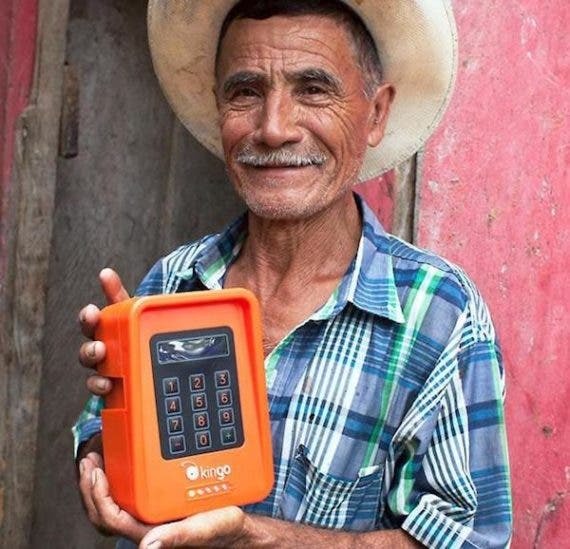 As of last summer it had already grown exponentially to include 48,000 households in Central America, adding approximately 6,000 new users every month. Last month Kingo reported a roster of more than 60,000 households and upped its installation rate to 7,000 monthly. That’s nothing. The company is aiming for 1 million users by 2020 and its website lists a goal of 100 million by 2035. That figure is apparently out of date. In last month’s press release announcing the new DiCaprio connection, Kingo cited a goal of 500 million users. If those figures sound pie in the sky, guess again. The key is to think about the way that smart phones have decentralized access to, well, everything. Now go on from there. To cite just a few examples, Facebook hit the 500 million mark back in 2010, Instagram logged its 500 millionth in 2016, and Apple is already claiming 500 million for its Siri digital assistant. First and foremost, we are talking about the bottom of the pyramid and low levels of income. So, they are less sophisticated than urban dwellers but they are aware of what technologies are available. In Guatemala, for example, there are an estimated 22 million phones but the population is only 16 million. With about five people per household, they are very well penetrated. We offer technology that is already validated. We supply and install the systems, and they work with a prepaid credit. We recruit a local shopkeeper, one per 20 users, who takes the Kingo ID and manages the app. Energy is just a building block. It provides people with the opportunity to increase productivity or start a small business, for example like an internet cafe. That’s why we also provide the consumption — the fridges, the televisions, etc. People never had these items before because they never had power. We include storage with every single one of our systems, and it is designed to be as efficient as possible. We have six different sizes of battery backs so we can tailor the product to the user’s needs, with a proprietary battery management system. Storage is one of the two most important elements. There is no way we could operate without storage, so it’s imperative to keep on developing more powerful storage capacity. Right now it’s much cheaper to generate energy than to store it. The expectation is that storage prices will come down, and we [Kingo] can drive that momentum by creating economies of scale and driving innovation. That could mean developing new storage technologies eventually, though for now Rodriguez foresees that lithium-ion will continue to dominate the market. All of this growth appears natural but in fact we’ve been working on this for close to nine years. This is the first time we’re coming out and telling the world what we’re doing. We want to play an important role in driving the world into renewable power, so we’re projecting the vision of becoming the largest clean energy user base in history. Now consider that about 500 million people globally use kerosene and other fuels for lighting, and the number begins to drop farther into the realm of possibility. Solar power is key to a future without fossil fuels, and Kingo’s technology will help enable broad use of clean energy across the developing world. I am proud to invest in Kingo as they seek to eradicate energy poverty, and I look forward to serving as an advisor to the company. The economics alone are favoring solar. Kingo foresees that solar plus storage will be the most economical solution for off grid households — if not now, then by 2020. Add the environmental and public health benefits of solar plus storage compared to fossil fuel, and there’s no contest.